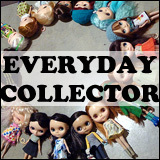 BlytheLife.com » What’s your favourite mold? All Blythe molds certainly have their charms. From the vintage Kenners to the more modern BL and EBLs with those lovely pink chips, downward glancing SBLs and easy-to-customize RBLs and FBLs. 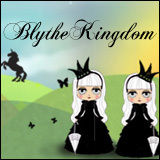 One of my goals is to have at least one Blythe from each mold – I currently have 2 EBLs, 1 SBL and 3 RBLs and I’d really like to finish out the group one day. There are little quirks about each mold that I really like. I love the pink chips on EBLs and their eyelashes and that melancholy look that they have. For the Radiance mold, I like how easy it is to take apart for what minor customizations that I do (gaze correction and sleepy eye strings) and for Superior, I have just the one (Velvet Minuet) and I love how easy it is to hand-roll the eyes to get the position that I want without the need to gaze correct her (despite the severe downward gaze that she, and other early SBL Blythes, have). I’d have to say that right now, my favourite mold types are probably EBL and RBL (I have never seen a Kenner, BL or FBL in person, although I know there’s little difference between BL and EBL for the most part!). So I just want to know… What’s your favourite mold type (and why)? QOTW: What’s your favourite face mold? 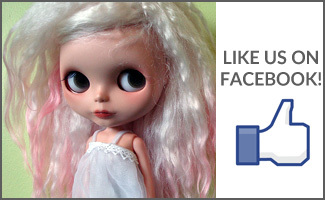 QOTW: What’s your favourite Blythe mold? My fav is definitely ebl, I love how sullen they look, but I also love how crazy the bls look! BL/EBL are my favorite. I love how they can switch from sad and sweet to totally nuts. But next is FBLs, because with a boggle they can totally blend in with the first two. My favourite, I’d say, is SBL! I really like that crazy downward gaze and with the right customizer, they can be so adorable!! ADG & RBL…although EBL has grown on me lately! forgot to say why. I like ADG because they customize into the cutest little girls and RBL because they’re easy to customize and I love their look! My faves are RBLS because they come apart so easily and I have had the easiest time customizing them. I do like the ebl look though but I have yet to own one. BL’s are my favorite! They are so quirky to me, my Edith is a little psycho! After BL, I’d have to say FBL is my next favorite. They seem so sweet and soft, like little girls. I think if i could only own one doll, though, it would be MSR…and she is a translucent RBL, so that would be my answer, then!